What's fall without a Paper Bag Scarecrow? Easy to make, this is the prefect craft for the fall season! 1. Fill your paper bag with crumpled up old newpaper or magazines. Fold over an tape shut. 2. From construction paper cut out thin strips of yellow (or any fall color) for your Scarecrow's hair, and don't forget to cut out some eyes and a nose. 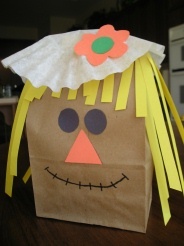 If you want to jazz up your Scarecrow's hat, cut out a flower to paste on top! 3. Tape or glue the stips of paper around the top of your bag. Once you are finished secure your Scarecrow's eyes and nose and draw on a mouth. Glue on your coffee filter hat and put on your flower! If you have some fall colored yarn around the house it would make good scarecrow hair as well!